Tinker Bell dress with underpants, head piece and wings. Escape to Never land in this Tinker Bell ensemble. This pretty little outfit is ready to take flight with Peter Pan and the lost boys! 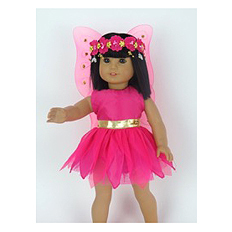 Includes hot pink fairy dress with wings and to bring that Tinker Bell look together a beautiful floral headpiece.